Tuesday night Meg came home from Young Women with two different pies. She put a little note in the refrigerator that the pies were hers and that we were not to touch them. (I should have gotten a picture of that.) The chocolate one she ate the next day. 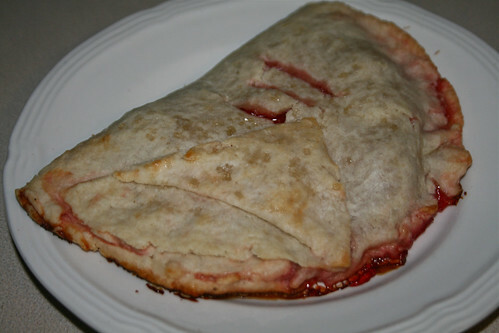 The cherry one (more of a turnover) needed to be baked before eating. She decided to have it tonight instead of the strawberry shortcake I made. It got baked and she devoured the thing in just a few minutes. It looked pretty good. I was going to ask for a bite but it was pretty much gone by the time I thought about it. She's been eating like a horse durning this basketball season. At least I know she runs it all off. News concerning Mattey: The flute has been found! It was in the backseat of the van covered by a blanket. I believe the van was one spot I suggested looking yesterday. Hmmm. I would like to wish my parents a Happy Anniversary. They have been married for 38 years. Wow! I thought about taking a picture of them for the blog but forgot my camera when I stopped by. I'm sure my mom would've not wanted to be photographed anyway. I'm going to hijack this post to report about Meg's basketball game. Tonight she played a tough game. She missed many opportunities to put the ball in the basket during the game but it was her determination that came through in the end. With the game tied at 10, the teams went to overtime to see who would win this defensive battle. Meg had a couple of opportunities in the first overtime, but nothing fell for her or her teammates. Luckily the other team couldn't score against our great defense, so it was on to overtime number 2. This time Meg took advantage of most of her chances (I won't say anything about the 5 missed points on free throws). She scored the first point, in what seemed like forever, on the second of two free throws. Her next bucket came on a nice drive to the hole and a short shot. Another basket came when one of her teammates stole the ball and Meg made the layup (finally). She scored all 5 of her teams points and they celebrated a hard fought victory. Their seventh in as many tries. It was amazing to see how determined she was to win this game. Her coach (and her dad of course) were so proud of her. Her coach said to the team, "I wish I had a game ball to give away because I would give it to this girl right here." Way to go Meg!